It’s Monday, so it’s time for another Women of the Bible podcast episode to drop! This week, join Erin, Alejandra, and Meg as they talk about Elizabeth from the Bible and looking at the bigger picture when you feel disappointment in life. Head over here to listen! Here on the True Woman blog, we’re also in the middle of a series on disappointment. I’ve invited my friend Elizabeth (not the biblical one!) 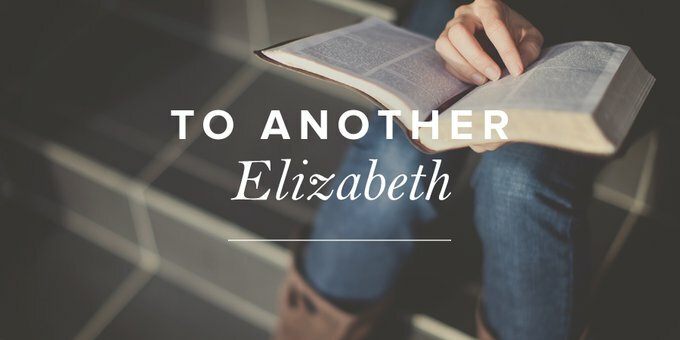 to share how Elizabeth (the biblical one) has made an impact on her journey through unmet longings. If you’re single or struggling with childlessness for any reason, this post is our letter of True Hope to you. But as I’ve grown older still, I’ve found a deeper connection to Elizabeth. We find her story in the first chapter of Luke, where we are told that she is the wife of a priest named Zechariah. We are told that “they were both righteous before God, walking blamelessly in all the commandments and statutes of the Lord” (Luke 1:6). This doesn’t mean they were perfect, but it does mean they strived to obey God and live lives that were free of obvious sin. But Elizabeth was barren. In those days, barrenness was often seen as God’s curse upon the disobedient. It would have been a great source of shame for Elizabeth. In the world’s eyes, she had failed as a woman. Nowadays, childlessness doesn’t have the same stigma attached to it as it did then. But it’s still a source of grief. Children are a blessing from God, but many are deprived of that blessing, not by their own will but as a consequence of the Fall. Part of God’s punishment for Eve’s sin was that she would bear children in pain. This is more than just labor pain; it includes everything that can go wrong in the reproductive process. Human sin broke the world in ways that affect every area of life, and Elizabeth was one of many who suffered because of it. We’re told that both Elizabeth and her husband grew old waiting for a child. This is where I can’t relate to Elizabeth—at least not yet. I’m still young. It’s very possible that I’ll meet a man, get married, and bear children. But my season of singleness has lasted longer than I ever expected, and there’s still no husband in sight. I’ll admit, I’m disappointed. More and more I’m longing not just for a husband but for children. It’s hard, if not impossible, to compare one person’s pain to another’s, but longing for children you don’t have because you’re single isn’t completely different from longing for children you don’t have because you’re infertile. And the pain of dashed hopes of one kind or another is something we can all share. However, God doesn’t leave Elizabeth in the place of disappointment. Like so many biblical women before her, Elizabeth goes from barrenness to pregnancy. But not just any pregnancy. This pregnancy is announced by an angel to her husband, Zechariah, while he’s serving in the temple. Zechariah reacts with unbelief and is struck dumb because of it. About six months later, the same angel appears to Elizabeth’s younger relative Mary, promising the birth of another child. Mary responds with faith and submission to God’s plan. She then travels to visit Elizabeth. When Mary approaches and calls out a greeting, the baby in Elizabeth’s womb leaps for joy. This prefigures the relationship of these cousins when they grow up, for Elizabeth’s son, John, will be the last Old Covenant prophet, announcing the coming of Mary’s son, Jesus. The as-yet-unborn John is thus the first person to recognize Jesus as the Messiah. If John is the first, Elizabeth is the second. Filled with the Holy Spirit, she blesses Mary and tells her what happened. She calls Jesus “my Lord,” and adds, “And blessed is she who believed that there would be a fulfillment of what was spoken to her from the Lord” (Luke 1:45). Elizabeth receives the fulfillment of her desire for a child. But what about those who don’t? What if I remain single for the rest of my life? What about the millions of infertile women who die childless? What about those suffering in other ways, with no relief in sight? We can find an answer in Elizabeth’s story, because her story isn’t just about her. It’s about Jesus. Elizabeth’s pregnancy is significant precisely because her son grows into the man who points to Jesus as the Lamb of God who takes away the sin of the world. Zechariah, for all his doubting, understands this. When his ability to speak is restored, the first words out of his mouth are, “Blessed be the Lord God of Israel, for he has visited and redeemed his people and has raised up a horn of salvation for us in the house of his servant David” (Luke 1:68–69). In the biblical world, horns represented strength. So a horn in the house of David means a king to rule over Israel—in other words, the Messiah. He is the One who comes to restore the world to the way it was meant to be. To quote “Joy to the World,” “He comes to make his blessings flow far as the curse is found.” That is our hope: There will be a day when all the wrong things that make us suffer are done away with. Jesus has made this possible, and He will complete it. This year during Advent, I wrote a poem expressing what I’d like to say to the biblical Elizabeth. One text that I drew on in writing it is Proverbs 13:12: “Hope deferred makes the heart sick, but a desire fulfilled is a tree of life.” May it encourage you and help you to believe that there will be a fulfillment of what was spoken to you from the Lord. The wrinkles on your face and hands spoke of years. Waiting and longing for a child. who would grow to be the King. Your eyes had shed rivers of tears. Your ears had heard the whispers of the gossips. Your heart had held the pain of disappointment, sickened by a hope deferred. But the proverb says that desire fulfilled is a tree of life. Your desire was the Tree of Life that our foremother lost. And bearing her curse in your body you longed to be made whole. I, too, bear your name, and I have tasted of the pain of rejection, of my own kind of barrenness. But then one day—a miracle! A child for the elderly, barren woman and her silent husband. You waited, holding joy within, praying for a safe delivery. Your younger relative, bearing a baby more miraculous than yours. She called out—your child leaped for joy. And you knew that not only had your child come, but the Child had also come. Second after the baby yet unborn. As strong as those you had shed in sorrow. And your desire shrank into a shrub next to the true Tree of Life. I pray for faith like yours to recognize the Child. For those joys must decrease, and He must increase. The curse-crushing seed of the woman.